In her tweet to LVP, Rinna had wished her a belated happy birthday with a picture of cupcakes decorated with pills. As LVP’s brother had died several months earlier by a reported drug overdose, the tweet was considered by many to be in poor taste. And let’s be honest-poor taste is one of Rinna’s most notorious character traits. In talking with Teddi, Rinna declared her innocence, claiming she would never send such an ill-intentioned tweet as her own sister died from a drug overdose. But would she? Let’s hope not, but Rinna spent several seasons chasing the obviously troubled Kim Richards around like a deranged substance abuse counselor, so her sensitivity to such matters is a bit suspect. Teddi backs up Rinna’s claims by stating, “Rinna has had her own family issues with this, and I do not believe she would in any way make a mockery of it.” But Rinna has been known to make a mockery of situations before, including alleging that hubby Harry Hamlin’s ex-wife Nicollette Sheridan dumped him for Michael Bolton. And making fun of people who celebrate Lent. And…well, you get the picture. If Rinna’s tweet to LVP was malicious in intent, it would be a new low-even for her. I will give her the benefit of the doubt in this situation, as I find it hard to believe any decent human being would do such a thing. Even one with an odd sense of humor like Rinna, who slaps her leg and cackles like a life-sized, animated Party City Halloween witch every time she makes a joke. Teddi has a point. Camille just started in on LVP like she had been saving up her animosity towards her for years. Like since Season 1? It sure seemed that Season 1 Camille was back in the house last night-the “says whatever is on her mind Camille.” The Camille who seemed to disappear after Season 1 and was much more careful in her comments. 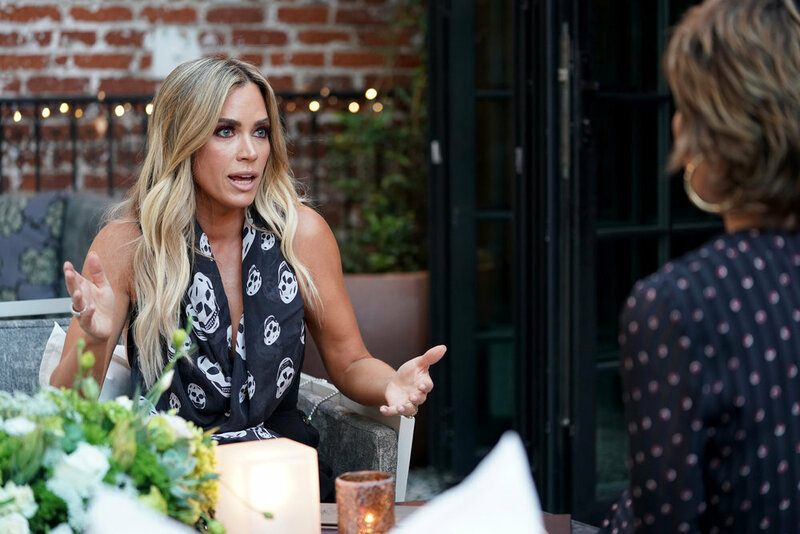 In wrapping up, Teddi also teases that the LVP vs. Kyle feud is not the only drama between the ladies this season. She writes, “I would just say let’s remember this dinner for when Camille starts coming after someone else for being a mean girl (as we saw in the season trailer).” Who could Teddi mean? Is she talking about herself, as she has been a bit-shall we say-nasty this season? Or is it Dorit Kemsley, whom Camille has had difficulty in hiding her disdain for the last few seasons? Perhaps perennial pot-stirrer Rinna? The rest of the season should be interesting. Watching the Kyle and LVP drama play out will hopefully give us answers to some of the questions we have about their friendship. And finding out who Camille targets as the mean girl will take us down memory lane with a Camille who had no filter. In other words, a Camille who wasn’t always very nice, but was a whole lot more interesting. TELL US-DO YOU THINK RINNA’S BIRTHDAY TWEET TO LVP WAS AN UNFORTUNATE ACCIDENT? WHO DO YOU THINK CAMILLE TARGETS FOR BEING A MEAN GIRL LATER IN THE SEASON?